Computer Entertainment Supplier's Association / Nikkei Business Publications, Inc.
Corporate Award, Audience Award are selected. SOWN2011 announces the 10 presenters! What is "SENSE OF WONDER NIGHT"? "SENSE OF WONDER NIGHT (SOWN) 2011" assigns spotlights to a game developers to draw wellspring of ideas with suddenly change the world. SOWN 2011 finds out the idea of a game causing changing sense: "SENSE OF WONDER". 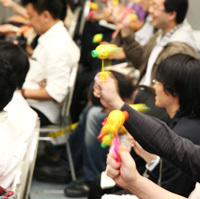 "SENSE OF WONDER NIGHT (SOWN)2011" will be held to provide an opportunity of the presentation for game developers at TOKYO GAME SHOW. Total of 9 presentation works picked from application more than 60 in total is carried out at previous event. Approximately 300 people have attended , and the venue at the selection has taken place in the prosperity with an international atmosphere. SOWN 2011 becomes the fourth anniversaries at the realization of the valuable plan to the game developer of every layer. The Screening Committee has traditionally been comprised mainly of game/application developers active on the front lines, but in light of the recent expansion of game platforms?including smartphones, tablets and web browsers?this year, the Screening Committee will be comprised mainly of companies engaged in the production and distribution of game content on a wide variety of platforms. “Company Awards” have been established. These awards bear the names of the companies to which the Screening Committee Members belong. Each Screening Committee Member individually gives the “Company Awards” to excellent works, based on prior reviews and presentations during the show. These awards are intended to create opportunities to bring out new pieces of work by connecting creators with new ideas and companies (Screening Committee Members) that can distribute content. *No extra prizes, such as prize money, are given. We have begun inviting entries to SOWN 2011. Why don't you show your idea to the Tokyo Game Show audiences who come from around the world? And we would like you to be inspired by other presenters and audiences and find new experience and network at SOWN. A game that employs technologies that have not previously been used successfully, such as natural language processing, physics engines, image recognition or gesture control, to present a new kind of experience. A game that pursues new ways of gaming expressions, a game which changes the player’s vision of the world after playing and experiencing it. A game that brings user’s activities into the game by including features such as AI interactions, different tools and social elements. A game that makes everyone think that they want to enjoy the new experience for themselves and feel that they want to treasure it. Any kind of new, eye-grabbing and impressive game!! A game in which the newness and highlight are focused on the elements comprising the game (such as the background setting, situation, character design, graphics, story, audio, etc.) instead of the game itself. However, a game providing a truly new game experience may be considered for acceptance. A game will not be deemed as being new and innovative just because it is focused on a specific user group (such as female users or the elderly). However, a game providing a truly new game experience may be considered for acceptance. A game of this kind will not be completely rejected from the screening process but they must demonstrate that it is capable of directly and tangibly providing a new game experience. The "SENSE OF WONDER NIGHT" event has received a lot of inspiration from the "Experimental Gameplay Workshop" that was started at the Game Developers Conference in 2001. We would like to express our thanks to the many people who helped to make these workshops a success and to all our friends.